Rice is a staple food in many parts of the world. It is delicious, filling and also healthy, unless you are on a low carb, grain-free diet. Rice is ideal for vegetarians and vegans and one can cook it in hundreds of different ways. Chinese, Indian, Mexican, South-American and Japanese rice recipes are some popular ways to cook rice with flavor. You can buy brown or white rice though brown rice is much healthier compared to white varieties. One pound bag of rice approximately yields 2-3 cups of rice. White rice will give you nearly 103 calories per half cup serving. You must store uncooked rice in an airtight tin or glass container. You could add some boric acid powder to the rice grains to keep pests away. Uncooked rice stored in this manner in a clean and dry place can last you for years while cooked white rice will stay in the refrigerator for up to 6 days. Make sure to thoroughly wash the boric acid-treated rice grains before using following different ways to cook rice. Here are some easy ways to cook brown rice and white rice along with some simple rice recipes for a fantastic meal. This is the best way to cook basmati rice or other rice varieties that have tons of flavors. Take one cup of basmati or jasmine rice and 2 cups of water in a saucepan.Add a teaspoon of salt and some ghee (clarified butter) or regular organic/grass fed butter, oil etc to the mixture. Adding the butter/margarine/oil is optional but it helps prevent the rice from sticking together and also from boiling over. It also imparts great flavor to the otherwise bland rice. Heat the mixture until it boils. Reduce the heat and simmer for 10-15 minutes. Check every few minutes to ensure that the rice is not burning at the bottom. Test the rice grain to see if it is cooked. If you find the grain is still hard, then add a bit more water and resume cooking by covering the saucepan. If you have a cast iron griddle, place this under the saucepan so that the heat gets evenly distributed and the rice cooks without sticking to the bottom. The liquid should be completely absorbed in 15 minutes. Replace the lid and continue cooking for 5-6 minutes more. Fluff the rice gently with a fork (do not stir too much as this could lead to breaking of the grains). This stovetop method is one of the best ways to cook long grain rice without breaking the grains. The microwave method of cooking rice is one of the best ways to cook white rice fast. Of all the different ways to cook rice, the microwave method is flexible and easy and especially suitable if you are travelling or living in accommodation without a stovetop. Combine 1 cup rice and 2 to 2 ½ cups of water in a microwave safe bowl. Cover it with a glass lid and cook for 5 minutes on full power. Check the rice if done, after 5 minutes. Cook for 2-3 minutes more. Fluff the rice with a fork. Stop the cooking and keep covered for 3 to 4 minutes in the microwave before serving. Brown rice requires more water than regular rice and you must use 2 and ¼ cups of water per 1 cup uncooked brown rice. You could also add broth in place of water to cook brown rice. Add a teaspoon of salt and 1 tablespoon of butter or margarine to enhance the flavor. Cooking brown rice on the stovetop– Combine 1 cup of brown rice with 2 ¼ cups of liquid and butter and salt. Bring the mixture to a boil. Now, reduce heat and cook covered for at least 30 to 45 minutes. Make sure you check every few minutes to avoid burning. As in cake of cooking the white rice, you can use a cast iron skillet to keep underneath the rice. This gives even distribution of heat and prevents the rice from burning. If all the liquid is absorbed and the rice is still uncooked, add some more liquid to the rice. Fluff the rice and keep covered for a few more minutes. Serve hot with vegetables, curry or sauce. Coking brown rice in the microwave-Combine one cup of brown rice with 2 ½ cups of liquid of your choice in a microwave safe bowl. Cover with a lid and cook on high for 5 minutes using full power. If your microwave allows it- reduce the power to medium and cook for 30 minutes. Check every few minutes while fluffing the rice with a fork. Once done, keep covered and let the rice remain in the hot oven for 3-4 minutes before serving. If you are looking for ways to cook brown rice fast- this method is better than the stovetop method. The pressure cooker method of coking rice is one of the fastest methods of cooking rice. You can use this method to cook all varieties of rice. Add 2 times the water as that of the rice and place the mixture in a metal bowl. Place the bowl in the pressure cooker. Make sure there is 2 inches of water at the bottom of the cooker. Carefully close the cooker and place the weight on the cooker’s steam outlet valve. Turn the burner setting to high. Once the cooker’s weight/whistle releases steam, turn the burner setting to low and cook the rice further for 5 minutes. Remove the cooker from the burner and keep in a safe place. Allow the cooker to cool completely before opening the lid. Be careful-there will be hot steam coming out of the cooker. Let the steam get released completely. Remove the rice bowl and fluff gently. You can add butter and salt as before, before cooking. Japanese sushi rice is sticky and needs a lot less water than other rice varieties. To one cup of sushi rice, add 1 and 1/2 cups of water. Bring the mixture to a boil in a saucepan, stirring occasionally. Lower the heat, and continue cooking for 12-14 minutes. Remove from heat and keep the rice covered for 5-10 minutes. You can now add the ingredients to make your sushi rice. Gentle boil method of cooking Japanese sushi rice– This method of cooking rice for sushi requires 6-8 cups of water per 1 cup of rice. Boil the mixture then reduce heat and continue to simmer for 12-14 minutes. Drain the excess water. Let the rice cool completely before adding sushi ingredients. Rice cooker method of cooking sushi rice- The rice cooker method of cooking rice is a slow method of cooking rice. You can place the rice (any variety) along with other foods like vegetables etc directly in the cooker. Some rice cookers only have an On/Off switch which clicks off like a toaster once the rice is done. The rice will remain warm until you are ready to eat it. Chicken rice– Add bouillon or stock/broth when cooking the rice. You can also add some chicken pieces-sauté them in a frying pan in some olive oil, then add the cooked rice, soya sauce etc. 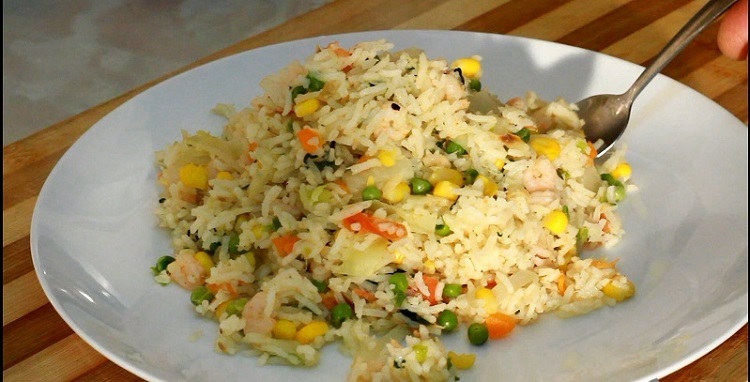 Vegetable Pilaf recipe– Add chicken or beef broth to the rice while cooking. Also add a teaspoon of soya sauce and a can or frozen bag of vegetables before cooking the mixture. Cheesy rice– Add parmesan cheese and some garlic salt to the rice. Add butter to enhance the flavor. ¼ cup each of chopped vegetables: bell peppers, juliennes of carrots, chopped mushrooms, peas, corn etc. Method-Heat oil in a wok. Once hot, add the ginger garlic paste and fry for a few minutes. Toss in the onions and fry on high heat until brown. Add the remaining veggies and fry on high heat. Next, make some room in the bottom of the wok amidst the veggies and add the egg. Continue to scramble the egg and fry the veggies. Now add the cooked rice and soya sauce. Taste the rice and, if needed, add some more soy-sauce or salt if needed. Garnish with chopped onions and sesame seeds. This is a different way to cook rice and eat your vegetables as well! Method: Mix all ingredients except the cheese and add salt and pepper to taste. Turn the mixture into a baking dish. Bake in oven (preheated to 350 F) for 20 minutes. Remove and add the cheese and bake for 5 more minutes. Use these tasty ways to cook rice with flavor and impress your family/guests with your culinary skills!